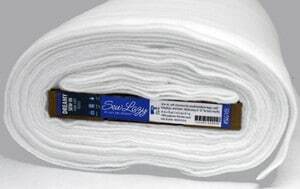 Currently Unavailable: Dreamy Sew-In Fleece has a soft, perfectly cloudy and creamy composition with just the right fullness and body to add soft structure to your projects. 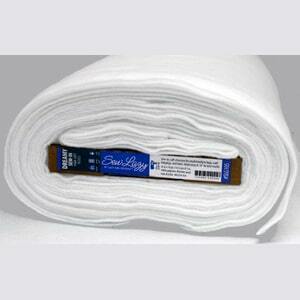 It’s a polyester version of needle-punched quilt batting, only better because polyester won’t shrink or deteriorate in the wash.
– Cut to size needed, place adhesive side (rough side) onto wrong side of fabric. – Set iron to medium, with steam. – Press for 10-15 seconds with fabric on top of Dreamy Fusible Fleece. on iron or pressing surface. – Allow piece to cool. – No need to quilt when fused to fabric. – Machine wash cool, machine dry low. Meet Sew Lazy: An Interfacing Fairy Tale Come True!